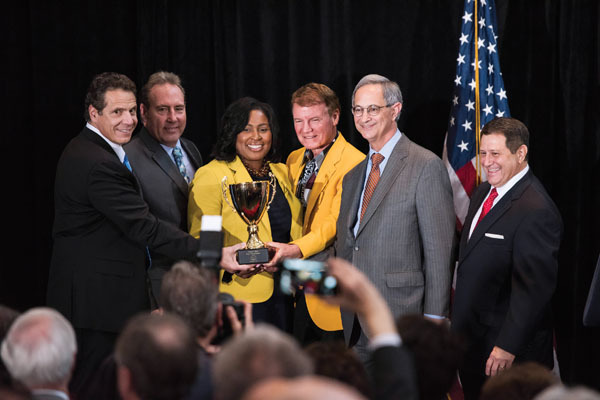 CELEBRATION: Governor Andrew Cuomo; New York Senator Joseph Robach; Rochester Mayor Lovely Warren; Wegmans CEO Danny Wegman; University President and CEO Joel Seligman; and State Assembly Majority Leader Joseph Morelle celebrate the awarding of $500 million in funding from the governor’s Upstate Revitalization Initiative. (Photo: Adam Fenster) More . . .
Finger Lakes region wins $500 million award to spur economic development. 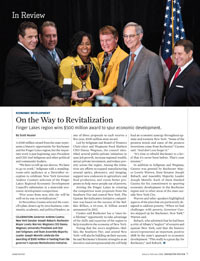 See the faces behind a regional development award. One of the earliest known images of Frederick Douglass is on exhibit. A rare, two-century-old bass visits the Eastman School. University celebrates Ronald Paprocki ’69, ’86S (MBA) for nearly five decades of service and leadership. Dean Gloria Culver says it’s the big questions that unite the school. Exhibition highlights the historic Ebony Fashion Fair. A NASA-funded study explores how space travel affects the brain. A biophysics graduate student shares his love of storytelling in venues old and new. Taking an artistic view of food history. Open Letter takes a global approach to literature. An archival project crosses generations. Finding an ethanol alternative, teen drinking patterns on Instagram, and other research news. A Rochester junior organizes support for victims of his homeland’s civil war. A question for Melissa Mead, the John M. and Barbara Keil University Archivist and Rochester Collections Librarian. A physics team earns international recognition, regional hospitals join UR Medicine, and other news. Yellowjackets named to All-American teams. Men’s soccer team posts program’s 600th victory, 200th for head coach.